Prior to this I had only read up through the “Legacy of the Drow” series of Forgotten Realms books by Salvatore and am fairly unfamiliar with the universe of Forgotten Realms as a whole. Jumping ahead in the stories of Drizzt, Bruenor, Catti-brie, Wulfgar, and Regis (The Companions) was therefore slightly harder to get into. Additionally, this is the first book of a multipart series of novels that are related primarily only in describing an event called “The Sundering”. Having no idea what this was, no clue what the “Spellplague” is, and no introduction to many of the groups and settings featured at the start of the novel additionally made it hard to start without doing a bit of research on background. So if you are coming into this new, I would say don’t, unless you are fine with a lot of aspects of the story being not entirely clear. Start elsewhere, or be prepared to look up background info. If you are familiar with the setting and characters then I imagine you would probably be already eager to read this. If you were like me and somewhat tired of Salvatore’s simplistic novels and mediocre writing, then you might want to give this a try. I had decided to read the remaining Drizzt novels I owned at least, but wasn’t sure if I would continue. Reading this I am impressed with how far Salvatore’s writing has progressed since his earlier novels. This is the best I’ve seen of his work, and partially that may be from a plot that allows him to ‘reboot’ the characters in a way as they are reborn into new lives. 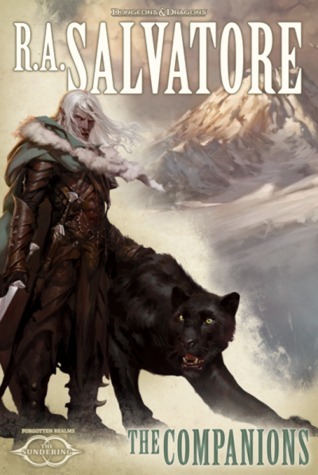 Contrary to the cover, Drizzt and his magical cat are not really in it other than a few pages. The focus instead is on Catti-brie, Bruenor, and Regis as each struggles with the consequences of their choices to be reborn into new bodies with all their previous memories in an attempt to help Drizzt face a future danger. Rather than having the character’s each revert back to their usual well-known and now clichéd behaviors, Salvatore nicely has them struggle with their rebirths as they try to work out how much their previous lives will influence their new ones, and how involved they wish to become with their new families and opportunities for a second, perhaps different life. In these ways the book is outstanding for the genre. The downside to it all, however, is that it doesn’t end up concluding like a true complete novel or story. Instead its entirety is merely setting up the varied protagonists and antagonists on the chess board. Thus, it ends up being like one big prologue with the only resolution being will they come back together and honor the agreement to help Drizzt or use their new lives to do something different. Despite the attempt to make things conflicted for each character, this all goes predictably for all the characters, re-raising the specter of limitability in Salvatore’s work. Whether caused by his own faults or by the unreasonable demands of his fans or publishers, Salvatore is incapable of closing the coffin lid on big, popular characters – good or bad. With this the book falls into children’s fare, simplistic hero stories with entertainment, familiarity, and predictability. While it is nice this has strong entertainment and improved writing, I wish Salvatore could take these tales into something a bit more complex and less obvious, not just a rebooted ‘twist’.